Bar maintenance is a very critical factor in the operation of today's high speed, high-horsepower saws. Stop for a moment and think about how much chain is traveling around the bar in one second's time. About 80 feet of chain pass one spot on the bar in one second. Over an hour's time, that amounts to almost 100km/h of chain. Given this speed and the light lubrication which the chain and bar receive, both the bar and chain are subject to wear through normal use. Where conditions of abnormal wear exist, they are often the result of poor maintenance practices. The faults are usually poor sharpening of cutters, loose chain tension, or inadequate bar and chain lubrication. The wear pattern on the bottoms of cutters, tie straps and drive links generally reflects the condition of your bar. Regular inspection of the chain will point out the need for corrective maintenance. Correct problems immediately and you can avoid further damage, or replacement of the bar or chain, or both. 3. Check your bar by sighting down it to see that it is straight. 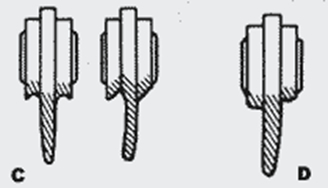 A bar can be bent in an operating accident and the user will not be aware of it. 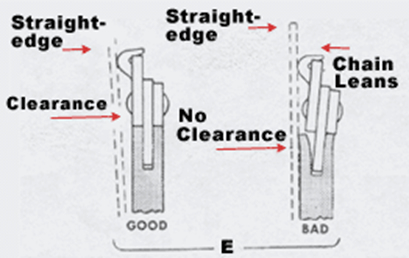 Bent bars should be straightened immediately or further damage will occur to both bar and chain. 1. Keep your cutters sharp and touch them up frequently. 2. File the cutters evenly. 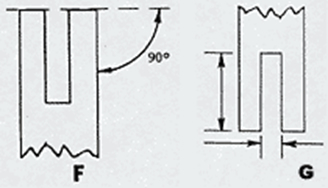 Be sure the filing angles are the same on the left and right sides. 3. Keep your depth gauges even on both sides of the chain and at their recommended settings. 4. Use plenty of bar and chain oil. Oil is cheaper than either a new bar or chain! 5. Remove the bar periodically and clean accumulated sawdust from the oil hole and bar groove. Turn the bar over regularly. 6. Tension the chain properly, just tight enough to be able to pull around the bar by hand. Check the tensioning frequently, but not while the chain is hot; wait until the chain is cool to the touch. At a speed of 85 km/h, four hours of saw running time means 300+ km of chain passing over the bar. Attention to the condition of the chain and bar, plus frequent lubrication, will safeguard your equipment.